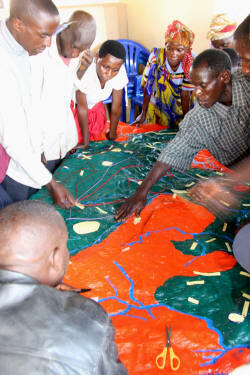 The 1:10,000 scale (2 x vertical exaggeration) Participatory 3D Model (P3DM) of Bwindi Impenetrable National Park, Uganda was completed in May, 2011. Bwindi NP is a UNESCO World Heritage Site, best known for the primates that make their home there. The 3D model measures 4.4 m x 3.55 m and represents 1,269 km2 on the ground. 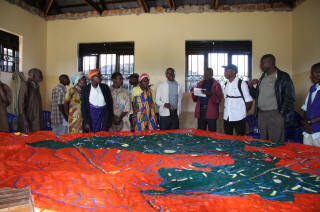 This is the 1st Participatory 3D Model constructed in Uganda. The exercise has been made possible by the coordinated effort of United Organisation for Batwa Development in Uganda (UOBDU), supported by the Institute for Tropical Forest Conservation (ITFC), ERMIS Africa and the Forest Peoples Programme (FPP), UK. Funding was provided by the ARCUS Foundation. The model has been done to document Batwa traditional knowledge and to support Batwa Peoples engagement with the management of Bwindi Impenetrable National Park. In addition the activity has been done to produce information that can support Batwa communities to secure their rights on their traditional lands within the National Park. Batwa communities were evicted from their ancestral lands in south west Uganda in 1991. The Batwa did not give their free, prior, and informed consent to the creation of these national parks and received no compensation. Since their eviction, the Batwa have struggled to survive on the edge of the parks and recieve little or no benefits from the parks creations. More than 100 representatives from the Batwa communities including youth, elders, women and men attended the exercise. The Batwa communities hope that the model will be useful for a number of different applications. With the number of Batwa elders slowly decreasing the making of the 3D model and its populating with information drawn from memory provided an opportunity for documenting and storing the Batwa’s unique cultural heritage. Such display of information can be used to open up both job opportunities within Bwindi as guides and through other tourism enterprises. 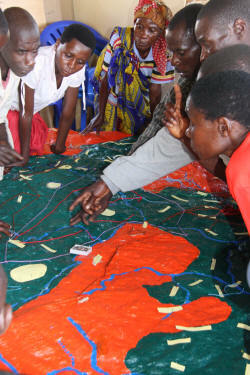 The communities hope that the information depicted on the model can be used as a platform to discuss with protected area managers about increased access to Bwindi and in particular access to specific locations and resources which are culturally significant to the Batwa like worshipping sites. Based on similar experiences in other parts of the continent and the world it is expected that the wealth of information stored on the model will serve as reference for communities to participate in the future management of their ancestral lands. As such the model provides an important tool in the Batwa’s ongoing advocacy and rights initiatives and provides a common platform for protected area managers and the communities to engage in on the long term conservation of Bwindi forest. Fauna & Flora International. 2013. Batwa cultural values in Bwindi Impenetrable and Mgahinga Gorilla National Parks, Uganda; A report of a cultural assessment. Fauna & Flora International, Cambridge. p 51.